The Clacton Queen is a Garrett 10-ton compound light steamroller, manufactured by Richard Garrett and Sons at their works in Leiston, Suffolk, in 1922. She was originally purchased by Zachariah Fairclough, one of the early developers of Clacton, and was used during the early 20th Century by Clacton Urban District Council, the fore-runner of TDC. The roller fell into disuse and decay during the middle part of the century, and was bought by TDC in the 1990s. 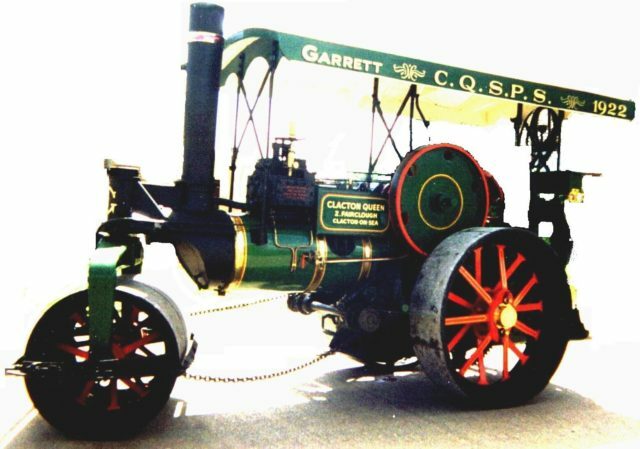 In 1995 the Clacton Queen Steam Preservation Society was founded by private individuals who, in the following years, restored the machine to a working condition and often display her around the town. Their efforts have been supported by TDC, which has supported the society for many years with the free use of the Queen and yard and building space at its depot. The Queen is now in need of some further major repairs which the Society has been fundraising for, and the Society needs to formalise its ownership so it can apply for various grants – while the council needs to increase its use of the depot site. Council officials and the Society have now reached a deal to include the sale of the Clacton Queen to the Society for an undisclosed sum, which will be considered by councillors in late April.